This is Part I of a series. Part II is available here, and has an updated graphic. However, looking at the original graphs on D&L and Griffs, I was struck that Hegel seems far too influential in the domain of philosophers---if you've ever taken the singular continental philosophy course offered by your local analytic university department, you'll know what I mean, that that simply isn't his status in the field. Aufhebung and The End of History are great concepts and were powerful historical influences, but do they really warrant being judged the single most influential philosopher of all time, even when the sample also includes the shoulders of the philosophers he stood on to think through those ideas (ie, Socratic dialectic)--and the after-traditions that cast him aside? My money would have been on Plato, but this graphic suggests that in fact, even now, Hegel is king. So, to explore why this was the case, I replicated this graph based on Simon's excellent instructions. I wrote it up in an ugly little R script which you're welcome to pull yourself to take care of the copying and Excel-munging. My overarching question here: what is causing this influence, and what alternate measures of authority show Hegel's influence more in line with these other network effects? My first guess was that changing this from an undirected to directed graph would make all the difference. That is, knowing that de Morgan and Wittgenstein are connected is less informative than knowing that de Morgan influenced Wittgenstein directionally---and we would see that changing from undirected to directed would mean that de Morgan would become a larger node and Wittgenstein a smaller one. A lot of this, quite frankly, is simply going to reflect time---you'd be hard pressed to influence Socrates today. While temporally unfair, it reflects something additional about the state of the world and might solve our super-Hegel problem. So, when I was about to make the switch, I anticipated that if we added arrows to the lines, we might see something very dramatic, perhaps as large as seeing all of Western thought divide itself between Plato and Aristotle, with everyone else just peripheral. What happened when I ran it? I don't see much of a difference, so I would say not much has changed. Unfortunately, making these changes did not cause a real reduction in the super-Hegel problem. 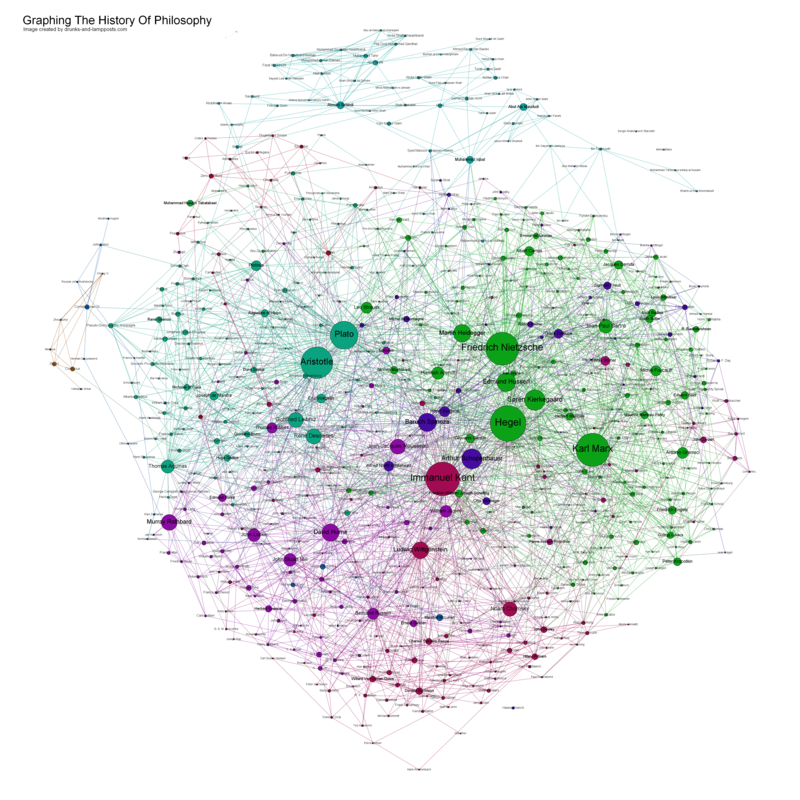 You'll notice the colors have changed---that's just a relic of importing the data set a second time. They're still the same groups, just randomized colors. To get the in-link and out-link positive and negatives right, you need to phrase source and target as influence flowing counterintuitively from influenced to influencer. So Aristotle points to Plato to show influence from Plato to Aristotle. Man is the measure of... Man? Second, I assumed Simon used gephi's default Authority measure for node sizing rather than PageRank. 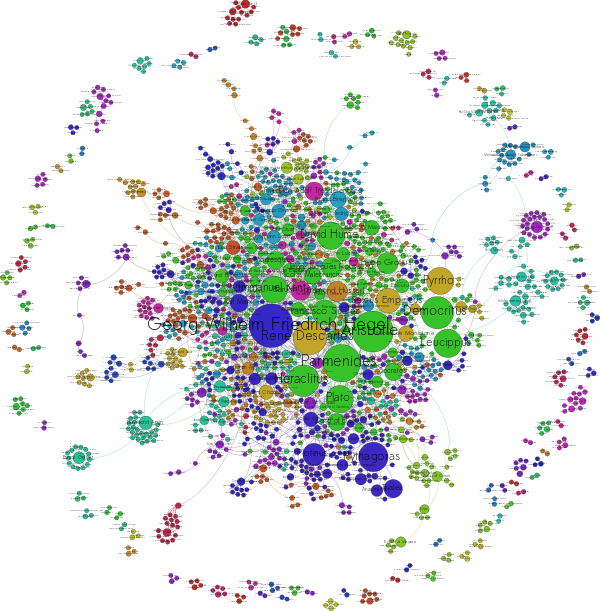 PageRank is the core of google's algorithm to decide who's important on the internet. It's a recursive measure that asks roughly whether more important people are referring to you and how much, which is maybe more in line with our intuition of what "influence" means. 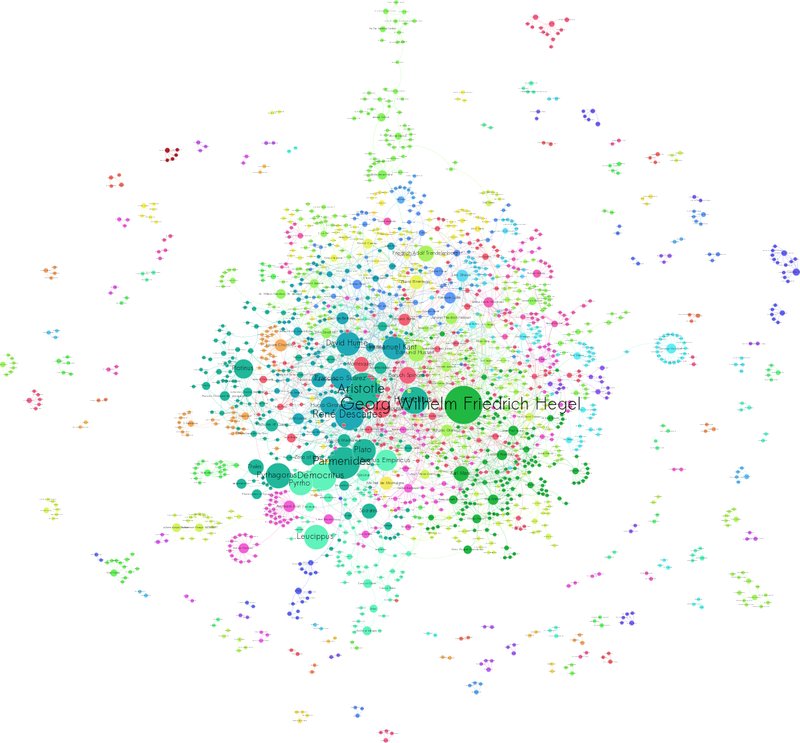 It turns out that the algorithm gephi uses for measuring Authority has a known bug, and only uses in-bound links. A-ha, this had to be the answer! Switching from Authority to PageRank did help some, but did not eliminate the super-Hegel problem. Aristotle and Descartes won some points, as did a few pre-Socratic philosophers like Democritus and Heraclitus. Still, it did not give much more weight to my Aristotle v Plato hypothesis. Hegel is still number 1. Data Ontology: There seem to be some issues with the ontology in the database behind the scenes. So, for example, Aristotle apparently had so many people catalogued that rather than list them, there is an entire page dedicated to "List of writers influenced by Aristotle." They don't show up individually in the query. I went onto this page and added them by hand, which helped some, but I suspect there are similar issues elsewhere with other major figures. While these entities convey aggregate influence, they're inconsistently applied, which muddies the graph. A better data munger than me would de-aggreggate these down to the philosophers influenced by or contributing to them. This may be possible with something as simple as improving the query to return only individuals, or perhaps a wikipedia guy fixing the ontology in the database. Sample Accuracy: There may be some sample issues from wikipedians' bias: Given that the sample pulled in was not limited to conventional philosophers, I wonder also if the general level of coverage of continental voices on wikipedia is just plain higher than analytical or ancients, just a bias existing from the interests of the participants. As a point of comparison, if you read any wikipedia articles on the discipline of economics, you would probably arrive at the conclusion that "Austrian School Economics" was on-par in the field with neo-Keynesian or neo-Classical schools, although it's a non-contender in economics departments. Sample Precision: Examining the query Simon developed, the set being drawn here is not exclusively philosophers. It rather contains people who have been influenced by philosophers---be they artists, musicians, writers, whatever. This explains a big portion of the post-Hegelian continental slant. Interestingly, it also pulls up a few political figues who had positions like administrative heads of propaganda in former soviet states. Yes, they were influenced by Marx (and Hegel), but arguably not philosophers. Whether the domain of philosophy is or ought to be restricted purely to professionals doing academic philosophy is a fair argument---it's just not the lens of the field I'm interested in seeing out of this current dig. This isn't an easy line to draw, however. Both Leo Strauss and Allan Bloom are in the sample. As are Harold Bloom and Terry Eagleton. I'd argue all four, right or left, are something more like "applied textual philosophers" who are to philosophy what engineering is to science in the literary sphere. Knowing their influences might be useful to understanding the influence of philosophers, it likely does not tell us the influence of philosophers on philosophy. Maybe I'm just wrong. Maybe Hegel is king after all. Anyway, overall, there are issues in the sample, some clear and some debatable, but Drunks and Lampposts really has won a victory for data munging. All of this data and the tools to process it have been available for some time. But it was Simon finding this Bricoleur hodge-podge of scraping, database, and visualization techniques to fashion them together that made an insightful graphic. And this is why I'd definitely support the claim that these kinds of "hacking skills" are on-par with traditional statistics, subject expertise, and visualization skills in the "Data Science" (I hate this phrase, but it's useful here) toolbox---all the latter are as good as nothing if you can't fashion the information together usefully. Right-brained creativity and narrative thinking are key. Brian Leiter's Philosophical Gourmet Report, which uses surveys of Philosophy faculties' assessments of other departments to rank philosophy programs, something similar to the above over time in application. # Format it as an edge graph. # If someone Aristotle influenced doesn't already have a node, drop them. The first graph I showed has better colors, more aesthetic spacing layout, and even a different authority measure (Katz Centrality) than the others listed in the body. To accomplish these things yourself, we'll need to add some R power to Gephi. In a later post, I'll show you how to do this directly in R using igraph, and after that, move on to an even cooler expansion. Stay tuned for Part II. Questions, comments, corrections? Contact me! Can you get the names to fit within the circles? What if it were 3 dimensional to reflect temporal influences? Yeah, I could get the names to fit within the circles. The trouble then is that some of the circles are so tiny, they're impossible to read. Some of the circles are a factor of 10 larger than others, and scaling fonts by a difference of 10x pt is too large a spread. However, it would definitely decrease the overlap messiness problem. I'll post a couple variations, soon. Actually, after some experimentation, it seems best to not make the variation so high not only for the fonts, but even for the nodes. Right now they're 10:1, but reducing to 4:1 is probably a better range, and would help legibility. Are you familiar with the work of the sociologist Randall Collins? 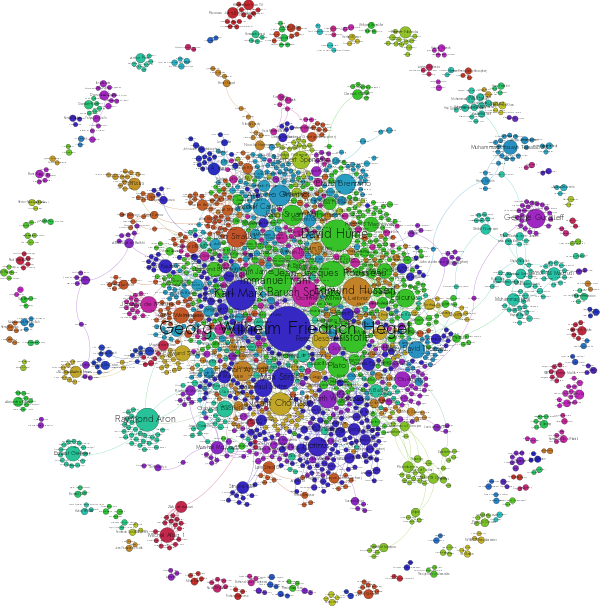 In one of his books (I want to say it's called "The Sociology of Philosophies," 1998 or so, HUP or Belknap) he does exactly what you're looking for - a huge sprawling network analysis of three thousand years of philosophy, basing connections primarily on whether (a) philsophers were personally known to one another, and (b) whether they attacked/defended their contemporaries directly in their work. You should check it out to see if that's what you want. I'll bet you could get Collins to send you the dataset he worked with. Clearly Wikipedia is a completely unsuitable basis for determining who has influenced whom... all those sidebars are simply the result of trench warfare between the fanboys of different obscure figures and the more patient editors who want proof. Ideally the datapoints you would want are (a) who did they have in their personal library? (b) who did they cite in their published work? (c) to whom did they write extant letters? (d) stylometrically, by whom were they influenced? But for a project like that we'll have to wait another fifty years or so. If I had to pick a best guess at a most useful methodology though, I'd capture all of it and let researchers sort through it depending on what they're looking for. =) So, ideally, you'd take the strategy where you wouldn't embed in the graph any explicit /judgment/ of whether the person was influenced, but the /material for forming that judgment/, very much like the items you mentioned. You'd include the variables you suggested, and also works themselves (Adorno & Horkheimer both wrote "Dialectic of Enlightenment" together, this text itself /is/ the line between them), as well as overlapping institutional appointments, common journals, citation, etc. ; and any scholar using the database would be able to assess how much those things mattered according to their own weights and observations. 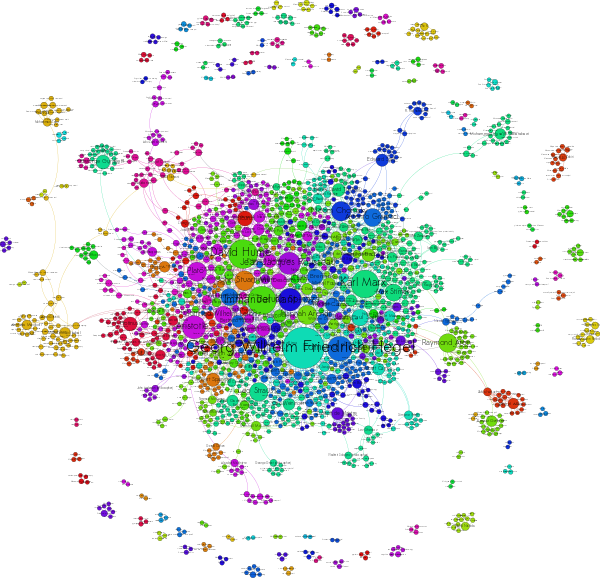 If you included /full-text/ as the linkages, wow, you could do some really cool stuff with modern graphs, even something like Amazon's "statistically improbable phrases" to pull together all mentions of "unhappy consciousness"---and see how these /themes/ evolve over time, and are repeated---and modified---by networks of thinkers. I think we'd need a research grant instead of just an afternoon of coding for that though. ;) It would take time, but is definitely accessible with technology of today, using current natural language processing libraries and graph math. Sheesh, I bet maintaining such a resource, you'd have the keys to the kingdom and a great panopticon view for seeing who was under-researched. About my doubt over Hegel's standing influence (yeah, I guess that insistence was probably quite grating if you're on the other side): I'm just basing this off personal (undergraduate) experiences as a very Frankfurt School Continentalist in a modern philosophy department. My mentors did their damndest to tell me to steer clear. Arguably, I was at Michigan which was particularly analytical, but I had to go into the German and English departments to find these strands of intellectual history---philosophy faculty just weren't having it (with a few /amazing/ exceptions I owe a deep debt to). That said, I think your statement of "the philosophical project of Russell and his generation was basically a rejection of British Hegelianism," is a very dialectically Hegelian assessment of Hegel's influence! I'd disagree that it wasn't so much that Hegel was saying "yes" and Russell was saying "no," but that Russell was saying "mu" and genuinely escaping the influence entirely, rather than rejecting it. His tradition wasn't influenced because they simply left the table and started participating in a very different, orthogonal conversation with different themes---I don't know that much of Hegel's ideas or agenda-setting were preserved, sublated, or contributory to that. Philosophers more or less just stopped doing metaphysics, and understanding Hegel had virtually no influence on set theory, utilitarian ethics, Popperian philosophy of science, etc. or other 20th century research themes. 1. "Subjectivity of influence" - I am not so much worried about the dirty unwashed masses, but about choosing our data or our methods in such a way that we read the assumptions of our age into the statistical "analysis", which completely invalidates the project. If I don't care what the data say, then why take an empirical approach at all? Why not just reflect on (say) why I take Aristotle to be more influential than Hegel, and unpack those assumptions until I'm satisfied with the level of self-comprehension I've achieved? Anyway, the key thing is to choose the methodology that you think is correct, and the right way to analyze it, and then run it through your software package once. Having already taken five whacks at the pinata, I'm sure you know you're headed into "14 tons, and what do I get" territory. 2. "Variables" - yes, full-text linkages was something like what I was suggesting with stylometric analysis. I know very little about stylometry or its statistical justification - I just know that it gives you ordinal rankings of the similarity of texts. So I assume you would be able to see, e.g., not only whether someone has been stylstically influenced by Aristotle, but whether it was Grosseteste's Aristotle or Jowett's. I take it what you mean about "statistically improbable phrases" is that stylometry can do factor analysis and show which elements of the text are contributing the most to the similarity? I'm not sure I would want to include shared journals or even volumes.... if getting published in the same journal does not induce you to cite one another or to write in a similar style, that seems like as good an evidence on lack of mutual influence as we can measure. I'm not proposing abandoning my current research to do this... I think that as the digitization of text proceeds and improves, we may well be in a situation by 2050 where the entire project could be concluded with the click of a button. (The stylometric and citation parts, I mean. Obviously drawing up networks of personal acquaintance would take more time.) No sense in trying to rush things. 3. Hegel's influence in America - Right, I guess I agree that in certain circles in Hegel there are philsophy professors who have not read Hegel, have read very few of his students, and in general cannot be reasonably surmised to have been influenced by him. But those departments (speaking very generally) have a bit of a prejudice against dead people, in general. Even to the extent that they assign, say, Descartes to their undergraduates, they rarely insist that having a firm grasp of 17th century French anti-aristotelianism is an important part of a rigorous philosophical training. So they are far more likely to be influenced by contemporaries than by predecessors, and thus are unlikely to affect the relative influence of Vico and Pascal. Among the American philsophers who are concerned with the mighty dead, on the other hand, there's a lot of Hegelian influence. Probably more Kantian influence, if I had to guess, but since America has only furnished a small number of the world's eminent philosophers, we don't get the final say. Perhaps we just differ in how we interpret "influence". I take it not to mean "agreement", but something like "lack of independence". For example, I would see Hobbes' influence on Spinoza's religious writings not to consist in some set of propositions on which Hobbes and Spinoza agree (in which, these two also agree with various other textual critics of the Bible), but in the monotony of Spinoza's appropriation of Hobbes goals, style, and strategy of exposition. But we can also say that Cicero influenced Machiavelli's ethical theory. That's not to say that the two agree on some set of ethical propositions - they agree on a few, but there are a great number on which they sit on opposite sides of the fence. But Machiavelli took the set of topics which he was to treat, and the questions which he needed to answer about them, as well as a number of illustrative tropes he had to rework within his theory, directly from the tradition of writing ethical handbooks which De Officiis inspired. If you look at the way that philosophers amend their views in response to their critics, you'll see what I mean about negative influence. They are rarely conceding premises or implications to their critics (that is, they aren't finding common ground), but nonetheless as they try to work their way around the objections that their most articulate interlocutors find most pressing, they get pulled into their orbit. Delayed reply---I got caught up working in making this a much cooler interactive visualization here. 1. Subjectivity of influence problem particularly with respect to models---right, you can bias your empirics to fit your beliefs, but non-empirical methods aren't immune to that, and might even be harder to diagnose because the method is more opaque, right? With an empirical method, you explicitly lay bare your criterion of evaluation in addition to your evidence and conclusions. There are definitely ways to cheat it, but I don't think their existence is any more of a reason to shy away from empirics than their counterparts should shy a person away from more qualitative evaluation or argument. The standard of being intellectually honest is just equally important whether looking through a qualitative or quant lens. I guess the danger of opening up that flank though means having to learn a new set of tricks to watch out for. Subjectivity of influence with respect to sources---definitely, a present data collection would embed present biases in ways that would be difficult to compare on an even footing to historical biases. But the best you could do there would be similar to a non-quant approach: you'd keep careful track of your sources, and weight them based on whatever context you're working in. How is hard, and has room for context and ambiguity, which is the richness of the enterprise, I guess. 2. Stylometrics--yeah, I think you're right on the metrics, and how you'd have to parse out bad samples like multi-author stuff. Digitization is also a major hurdle, and even a deal-breaker in some places. I'd actually have my money on the major difficulty being last 80 years stuff still under copyright. Academic journals are one of the best rackets in modern capitalism. Open knowledge is very expensive when you don't have a university library subscription behind you, for what amounts to the cost of a well maintained blog aggregator. 3. Hegel in America--the Hegel v Kant v Descartes distinction is a great one to draw. I've assumed that Descartes entered philosophy intro courses because of accessibility---we've all wondered whether the world exists, probably fewer people have idly sat to wonder how a priori synthetic truths were possible, even though both are epistemology topics. Maybe that's what's hit Hegel's reception in a modern department--we can split epistemology apart from ethics, but it's harder to disentangle Hegel's ontology from normativity? (Even though that's sort of his point.) The positive v normative split is a 20th century thing in defining our sciences, right?---I guess if you take the rise of that division as a reaction against Hegel, I'll take it that he was the most influential. ;) But I'd argue it would have come up on it's own, just maybe with a little less venom. 4. Influence and rejection---I'm on the run, but will reply on this in a separate post later, because I think your example is brilliant. Really happy to see these types of data visualizations picking up. which is very raw and lacks content as I have only developed this with $500! I will however want to do more in the future. The issues I have encoutered were related to show how "meaningful" those connections were versus just how many there were. I will be keeping an eye on this page. Keep up the good work ! That's a very interesting network! I did not quite get how you defined the edges. Could you please explain which kind of data were used to define who is linked to whom?